Turn-out was small but enthusiastic! After the morning briefing / BS session, the team leapt into action! Socket Sorting - Roger has been buying tools again, and was looking to unload some! Sockets seemed to be the tool du jour, but they were all in baggies and jumbled up. So the guys started sorting, metric and standard, and by sizes. Then breaking them up into complete sets! Several guys went home with "new" tools! Model T Speedster - the aircraft action was pretty limited, but Roger has been diving heavily into the Model T Speedster project and had received a bunch of parts back from the powder coaters! Like the chassis! 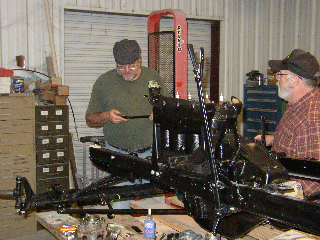 The engine was ready for installation, steering gear needed some work, and various other components needed to be fitted up and attached. The brass radiator shell looks gorgeous. The project at times was a major brain drain as everyone stood around scratching their heads over some minor detail, but overall great progress was made! 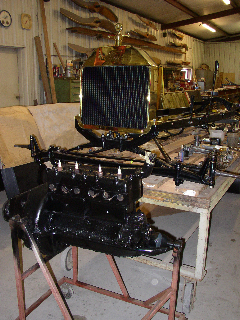 The chain hoist was used to install the engine after the chassis rails were jury-rigged up off the workbench to permit clearance for the engine's sump pan! Several guys worked on the steering rod and its fit within the steering column and its interaction with some gears. Dave Orloff, Adam, and Dave Edgerly were the main workers on this project as best I recall. Fokker Triplane - was taken out of the hangar and started up to keep it exercised. We also had some special visitors on the property, a Mr. Loughead from the Austin area. And yes... Mr. Loughead is related to the man who started Lockeed Aircraft Company! He had never seen a rotary engine run, so we pulled it out and started it up! Fokker D.VII - Tom Miller and Terry Bledsoe pulled the trailer out of the weeds and Tom started fixing it up for the Wheels & Keels trip at the end of April. Roger explained how the trailer needed to be configured for the wings - eazy-peazy stuff, and stone simple. I removed the two fake machine guns from the Triplane and brought them back to Houston to try to refurbish a bit as they are looking very shabby. Mike McCormick and I then set about getting the new nose bowl to fit the airplane. After a false start and some help from Roger we got the thing lined up straight and several holes drilled in the bowl which allowed it to be clecoed to the lower engine cowling and the two upper engine cowlings. This suspended the nose bowl in the proper place and cut-outs were made in the bowl edges so mounting plates can be fashioned. 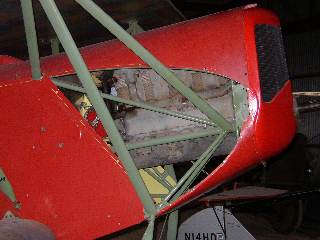 The engine cowlings were marked for trimming next work day.